There are 122 villas on the list of the Vesuvian Villas, splendid residences from the 1700s spread out to the east of Naples along the coast in the direction of Mt. Vesuvius. (Some have been restored as part of a master plan to showcase that bit of the architectural and cultural history of Naples. See the above link to the Vesuvian Villas.) The villa d'Elboeuf is the first of these in chronological order and among the worst preserved among the lot (photo, right). There is always talk of restoring the villa d'Elboeuf and one always hopes that something will be done, as, indeed, something has been done for some of the others. It is, however, a very tall order. 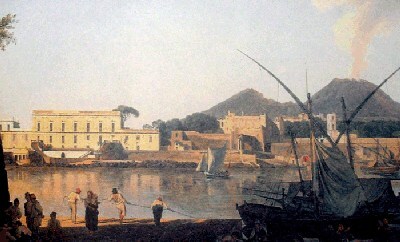 The Villa d'Elboeuf was built on the coast adjacent to the Granatello dock (photo, below, right) in Portici in 1711 by the duke d'Elboeuf (Emmanuel Maurice, Duke of Elbeuf (1677-1763), a French nobleman, who served under Holy Roman Emperor, Joseph I, at Naples as lieutenant general of the cavalry during the Wars of the Spanish Succession.) The architect was the idiosyncratic and delightful Neapolitan, Ferdinando Sanfelice, whose best-known work in the city of Naples is no doubt the Palazzo dello Spagnuolo. The building was to a design of two floors with a loge facing Mt. 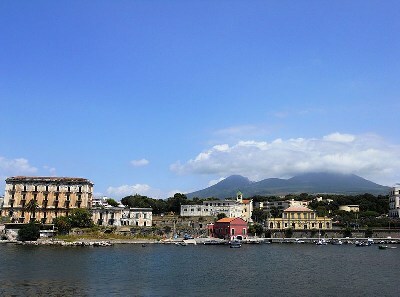 Vesuvius and two terraces on the sea, one facing Torre del Greco and the other Naples. The design included Sanfelice's trademark double elliptical staircase with marble banisters (example here, by Sanfelice). The duke diligently planted exotic flora in the grand garden and added some ancient Greek artifacts from a place nearby, which we now call the archaeological site of Herculaneum. (Some may say he deserved a few bits and pieces since he is the one who apparently made the first discoveries, or at least heard that some local farmers had found marble slabs that he could use for his new residence. Manny Maurice was not an archaeologist and had NO interest whatsoever in really finding out what it all was or in preserving any of it. It just looked good in the garden! Scientific research at Herculaneum came later. The results were stunning; when the new Bourbon king, Charles III, and his queen consort, Maria Amalia of Saxony, were aboard a vessel in the gulf in 1738 that had to seek shelter from a storm, they docked at the duke's residence. Charles was so impressed by the premises and the beauty of the surroundings that he decided to put his new royal palace right next door in Portici. The duke ceded his property to one Giacinto Falletti, and from there it passed to King Charles, himself, who turned it into a sort of dependency of his own new royal palace. Historically, thus, the villa d'Elboeuf deserves some attention since this is where the age of building splendid villas in the 1700s in Naples started. The king's heir, Ferdinand IV, expanded the villa d'Elboeuf even further. The decline of the Villa began in 1839 with one of the first great ravages of progress, the construction of the first railway line in Italy; the tracks went right between the main building and the park. It must have seemed quaint at the time. "Decline? Haaah! We only use this steam-monster once in a blue moon and it's not like it's going to expand or really get us anywhere, right?" In this place I saw joined, as by a magic spell, a tranquil sea, a surprising mountain, woods, gardens, quiet, pure air and the heavens of Italy. What more could you ask for? [Guido Rapolla, Memorie storiche di Portici, 1891). Times change; the urbanization of the area has been disastrous for attempts to reanimate the 18th century in the 20th & 21st-centuries Naples. Also, the destruction wrought in the immediate area by the bombings of WWII did not help. And so, the first of the great Vesuvian Villas is in squalid shape. The property was sold in 2011 to a private entrepreneur who is contractually bound to restore it. Stay tuned. photo credits: all photos, including photo of the painting, by F. Scala.